Clinton held 58 fundraising events to raise her total; Sanders held seven. 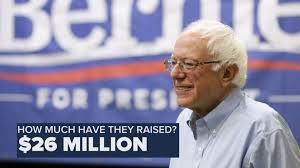 As of the end of September, Sanders had brought in 1.3 million total donations from 650,000 individuals since he began running. Clinton’s campaign did not release how many total donors she has. And Sanders ended September with $25 million in the bank; Clinton did not release how much money her campaign had on hand. That story line is — as you might have guessed — not a good one for Clinton. It reinforces everything that people already believe about the dynamics of the contest — that Sanders is the energy candidate who is speaking the language of the base and that Clinton continues to struggle to inspire that sort of devotion and passion. Then, of course, there is the simple fact that if I told you six months ago that Sanders would (1) raise $25 million in a single fundraising quarter and (2) would come within a few million dollars of Clinton, you would not have believed me. No way. Sanders, who began this campaign as an oddity, now has every vestige of a serious candidate — from crowds to organization to money. And he has the one thing that Clinton badly wants/needs: energy. There are practical realities of Sanders’s fundraising, too. Having $25 million in the bank, and having raised $40 million, Sanders will now be able to get his message out — largely via TV ads — in at least Iowa and New Hampshire. Clinton and her aligned super PAC will still outspend Sanders on TV, but it won’t be totally lopsided or at least as lopsided as everyone, including Sanders and his team, expected. The controversy over Hillary Clinton’s use of personal email while she was secretary of state is showing no signs of easing, as the number of messages now deemed classified doubled with the State Department’s latest release and as more details emerged about the potential vulnerability of her account. Wednesday’s release marks the first time the State Department itself has deemed messages in Clinton’s account to warrant protection at the SECRET level — the middle tier of the national security classification system. State earlier classified one Benghazi-related message SECRET, but did so at the request of the FBI. Hillary Clinton continues to lead the Democratic field in a new USA TODAY/Suffolk University Poll, but she no longer commands the support of a majority of Democrats as Vermont Sen. Bernie Sanders and Vice President Biden gain ground. Clinton is backed by 41% of likely Democratic primary voters, a double-digit drop since the USA TODAY poll taken two months ago, and Sanders is supported by 23%, a jump. Biden is the choice of 20% even though he hasn’t announced whether he will jump in the race. Clinton remains the clear front-runner for the Democratic presidential nomination in 2016, leading Sanders by 18 percentage points and Biden by 21. But her challenges also are clear. In July, for instance, her favorable-unfavorable rating was narrowly negative, at 43%-47%. Now that gap has grown to 12 points, at 39%-51%. In contrast, Sanders has a 37%-33% favorable-unfavorable rating, and Biden’s favorable rating is a healthy 51%-35%. …The controversy over her decision to use a private email server instead of the government system when she was secretary of State is hurting her, although more among Republicans than Democrats. Six in 10 of those surveyed say the issue bothers them and even more, 70%, predict it will hurt her in a general election. Even about one-third of Democrats and two-thirds of independents are disturbed by the controversy, as well as nearly nine in 10 Republicans. While Clinton still leads in the national polls, Sanders has a large lead in New Hampshire and the race is close in Iowa. Wins in those two states would lead to a tremendous change in the race in subsequent states. Even the current fund raising numbers should have a major impact with how Sanders is perceived and covered by the media. Posted in Bernie Sanders, Hillary Clinton, Joe Biden, Politics, Polls. Tags: Bernie Sanders, Democrats, Hillary Clinton, Joe Biden, Politics, Polls. RSS feed for comments on this post.. TrackBack URL. I think for the first time we may have a national media awareness that Bernie is the one to talk too about ALL of the issues. I donate $20 a month because I can't afford to be screwed over by someone that just pays lip service during the campaign.